Goalkickers: H.Clover 3, G.Gough 3, H.Davie 2, H.Ross 2, H.Dunn 1, B.Koop 1, C.McSwain 1. Soon after the commencement of the second term Richmond had added two goals. The Blues' forwards missed vital chances scoring two behinds, then Harry Davie's shot hit the post. Good play by Tommy Downs and Horrie Clover resulted in George Gough kicking his second and Carlton's third goal. The noise from the crowd was a continual roar. Then Horrie Clover added another behind. Rain began to fall and defenders Frank Donoghue and Ted Brewis turned the Tigers forward moves. It developed into a battle of the back lines as Richmond held onto a 9 point lead. Alex Duncan despite the greasy ball took a fine mark on the back line. Ted Brewis then gave Horrie Clover a chance to score but he only added another behind. From a scrimmage deep in the forward line George Gough soccered the ball through for a goal. The margin was now just 2 points. However, just before the bell Richmond scored another behind and a handy goal. At half time the Blues trailled by 9 points, 4.7 - 6.4. With their last chance to use the wind, Carlton launched an all out attack. Kicking the ball high to allow the wind to carry, it was successful. With Vin Arthur winning on his wing, the Blues added goals to Hector Ross and Horrie Clover, a behind was also added. Ray Brew was playing a captain's game by setting a fine example. The Tigers were now on the back foot with Blues dominating in the air and playing dashing, exciting football. A chain of hand passes resulted in Horrie Clover kicking Carlton's seventh major. The visitors replied with a goal and the margin was back to 2 points. Richmond went on the attack but was stopped by Fred Gilby who was playing a grand game. Carlton captain Ray Brew went down with leg cramp, but the Tigers regained the lead. Horrie Clover was busy on the forward line, and as a result of his work Bill Koop goaled. This was followed by a shepherd from Clover which allowed Charlie McSwain to add another goal. At three quarter time the Blues led by 9 points, 9.9 - 8.6. The Tigers goaled to reduce the lead to 3 points. 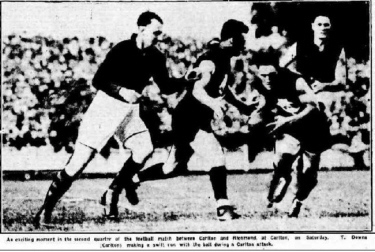 Alex Duncan repulsed another forward move, and ball went into Carlton's forward line where Harry Davie cleverly snapped a timely goal. Again Richmond answered with a goal, and further attacks were held up by Carlton's defence. Trainers went out to assist Frank Donoghue. Three points separated the sides with just ten minutes remaining, the crowd was on edge with excitement. The game then swung Carlton's way when Hector Ross scored the eleventh Carlton goal. Then the icing was on the cake when first Horrie Clover, and then Harvey Dunn goaled to seal the game. Carlton's strength won out and the Blues won the match by 21 points, 13.9 - 10.6, to go to the top of the ladder with a percentage of 140.7. Note: At the far end of the Gardiner Stand is the original press-box which stood until 1934. It's replacement lasted until the building of the Elliott Stand in 1986. Contributors to this page: PatsFitztrick , blueycarlton , Jarusa , pblue , Bombasheldon , timmyd , molsey , WillowBlue , camelboy and admin . Page last modified on Wednesday 22 of July, 2015 22:13:26 AEST by PatsFitztrick.